Candlestick patterns have little value without the right trend context. 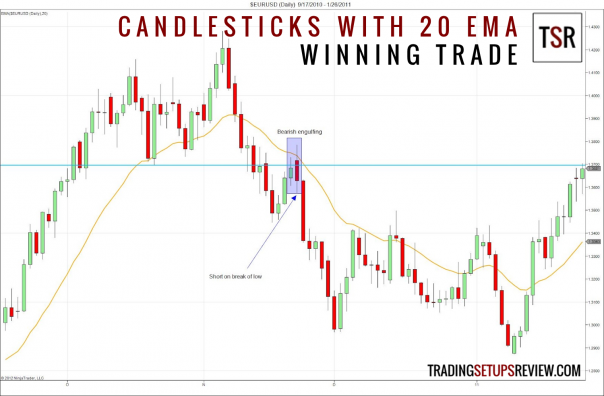 Hence, a popular trading setup uses candlestick patterns with a moving average. The moving average provides a simple way to find the trend context. This review assumes a basic understanding of candlestick patterns. Look at the Encyclopedia of Candlestick Charts (Wiley Trading) by Thomas Bulkowski for a solid reference on candlestick patterns. Despite their often mystical names like engulfing and shooting star, candlestick patterns are not magical. They are simply well-defined price action patterns. Focus on the price action: high, low, open and close. Forget the names. In our trading examples, we will use a 20-period exponential moving average (EMA) to define the trend and support/resistance levels. This is a candlestick chart of EUR/USD forex. We looked out for candlestick patterns with a moving average. 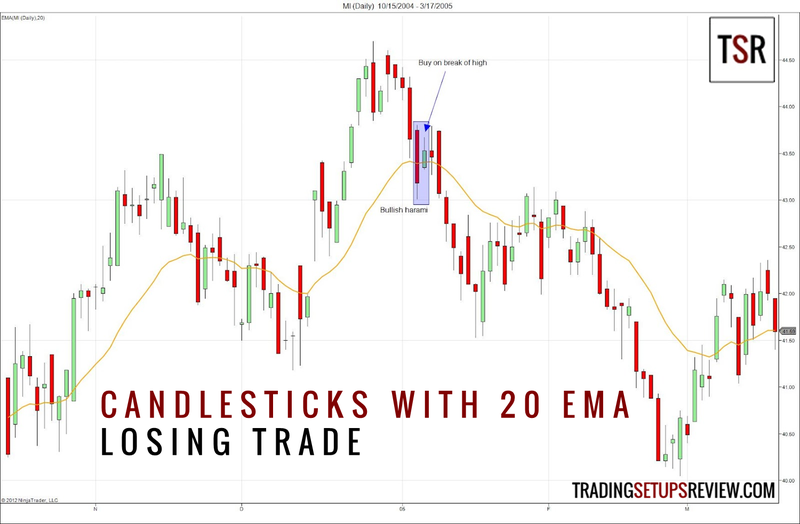 A trade setup came as a bearish engulfing candlestick pattern formed at the 20-period EMA. The next day was a strong bear trend bar. It triggered our sell order at the low of the pattern. This trade followed through quickly. Look at the top of the chart. After a test of the previous trend high, prices reversed down with strong momentum. The pullback upwards tested the 20-period EMA and the low of a prior trading range (the blue horizontal line). The bearish engulfing pattern showed strong rejection by these resistances. This trade had the potential to catch the beginning of a new downwards trend. When trading candlestick patterns with a moving average, you can use the distance between the candlesticks and the EMA to judge the momentum. In this case, the large gap between the candlesticks and the EMA showed the bearish momentum. This is a daily chart of Marshall & Ilsley Corporation. We saw a bullish harami right on the 20-period EMA. The next day broke the high of the inside bar. We went long but the trade went against us. A key candlestick principle is to wait for confirmation. Many traders wait for one more candlestick after the pattern for confirmation. However, waiting for confirmation indiscriminately is not a good idea. This is why my trading rules are to enter upon break of the high or low of the pattern. Of course, for the weaker trading setups, waiting for confirmation is prudent. Here, we saw clear downwards momentum. Prices also closed below the EMA with ease. Given such strong momentum downwards, it was wiser to wait for bullish confirmation. The confirmation never came. Hence, an astute trader could have avoided this trade by demanding some signs of returning bulls. Candlestick patterns are well-defined pieces of price action with clear underlying market concepts. Beginners will find candlestick patterns useful for picking up price action. Using candlestick patterns with a moving average helps to clarify the trend. It also helps us assess the candlestick patterns better. Hence, combining candlestick patterns with a moving average is a simple yet effective trading approach. However, candlestick patterns are for clarifying price action. Do not use them to force rigid interpretation on price bars, give them mystical names, and expect predictable results. Focus on the context, understand the nuances within each pattern, and be flexible when trading them. Only For Candlestick Enthusiasts: Trading Candlesticks With RSI & The Sakata Method Review. An experienced trader shares how he trades using candlestick patterns with a moving average. Profitable Candlestick Trading: Pinpointing Market Opportunities to Maximize Profits (Wiley Trading) by Stephen Bigalow, a widely cited candlesticks expert. How to trade profitably using combination of directional movement, macd & candlesticks. Hi Wai, you can take a look at these strategies for some ideas – 4-Hour MACD and Holy Grail. What type of apply use in EMA setting ? Close, Open, High, Low or other ? i used ( Medium Price ( HL/2 ) ) in my EMA setting because this setting was average between all other but i,m not sure about this, are you any suggestion for this ? Hi Vito, the median price is a good choice. The close price is usually used due to its significance on daily charts. It helps to understand their differences. The median price MA is smoother but less responsive compared to an MA constructed with closing prices. I think placing both on your charts is a good way to determine which one works better with your trading approach. i place both MA on chart for comprasion. Glad to help! It’s definitely possible for you to drill down to a lower time frame to refine your entry. That will potentially allow you to set a tighter stop-loss. But due to an increased possibility of whipsaws, you must be prepared to re-enter your position. Looking at multiple time frames tend to create confusion. Hence, you must have a clear trigger defined for the lower time frame.